Do you have a qualifying ferret? that requires medical or specialized rehabilitative care? If you think you do...please contact us with your story!!! Please put "Blizzard Memorial Fund" in the subject line. We are here, ready and willing to help...you just have to let us know. Click a pic above to go to the store with products of that pic. "Blizzard was a wonderful ambassador and this memorial is a great way to recognize his contribution wherever you took him. Congrats to you and your wife for giving him the opportunity to show people what a great and loving friend ferrets can be." Every once in a while an animal is born that changes people's lives forever. Blizzard is one such animal. 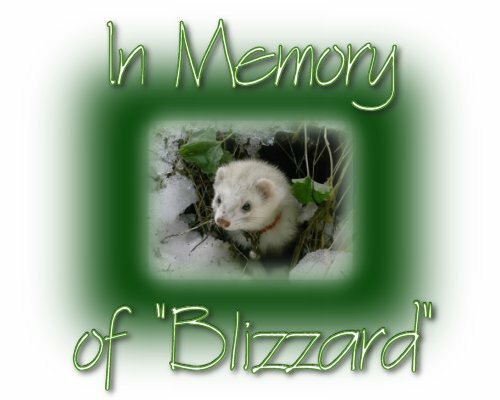 A Marshall Ferret animal, Blizzard was born 12/18/02 and lived until 8/7/08. My wife and I got him at PetCo and we realized he was special from the beginning. 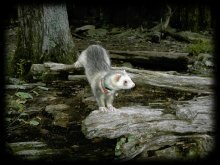 He went on to a life of an ambassador for all ferrets as we did everything together, hiking, snowshoeing, shopping, swimming in the ocean, walks along the beach, going to parties, sightseeing, and a daily dose of just loving us as we loved him. You have probably read about his adventures on the Ferret Mailing List, or American Ferret Association or Ferrets Anonymous or seen some of his photos as they have won prizes from our nation's capital to California. Blizzard would very rarely be attached to a leash when we walked/hiked as he preferred to walk with us and on the way back lead the way! The world has lost him to kidney failure, but while he was here he had a wonderful life and gave us the same. We wish to make sure to the best of our abilities that other ferrets have a good life too. Or at least a good shot at a second chance of life. I am speaking of this country's shelters for ferrets. 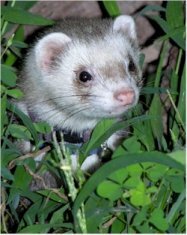 Across this nation, top to bottom...coast to coast, abused and neglected ferrets are either turned in to shelters or are found, almost dead and in pain by the local police department and are turned in to shelters. These ferrets require extra special care and immediate medical attention. This is a human cost in time, energy and money for the volunteer shelter moms and dads that are helped by Support Our Shelters. If they live after being dumped as garbage or are left in the snowy winter to die a cold death, they have probably spent their entire lives behind bars in a small cage. They do not know what it is to be a ferret, to be free, to have fun, to explore. For Blizzard, although he had a huge cage, the cage was open 24/7. Blizzard loved to spend time indoors with us as well, playing in his tubes and tunnels. Not to mention playing hide-and-go-seek with us! Blizzard's parents and S.O.S. are asking for you to make a charitable donation to Support Our Shelters (SOS) to the first Memorial Fund ever ok'd by SOSThe Blizzard Memorial Fund. There will be a special bank account setup for this Fund with monies to go specifically towards abused and neglected ferrets to keep them alive, to show them some love and to allow them to play with their first toys. Many ferrets coming into Ferret Shelters arrive there in appalling condition, not having known love before, and some not even knowing what toys are. 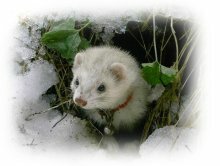 This Fund is to help save their lives, so they can be shown that love, and for them to learn to be happy healthy ferrets. Won't you help these ferrets that are still alive that have so much to give, and give it unconditionally to those that will love them? Please send your checks today to Support Our Shelters and put Blizzard Memorial Fund in the memo line. We thank you, the ferrets you will be helping thank you, and if Blizzard is still waiting for us at The Rainbow Bridge, we are very positive that he would thank you as well by kissing you on your nose!